It’s time for another “What’s on my…” round-up with my favorite foods, outfits and more! Salad!!! I have been loving salad all week from homemade ceasar salad with chicken to mixed greens, berries, goat cheese and walnuts, to tuna salad with tons of crunchy veggies mixed in! I always have some combination of greens, protein and veggies: if you eat just lettuce and carrots, you’ll be miserable! 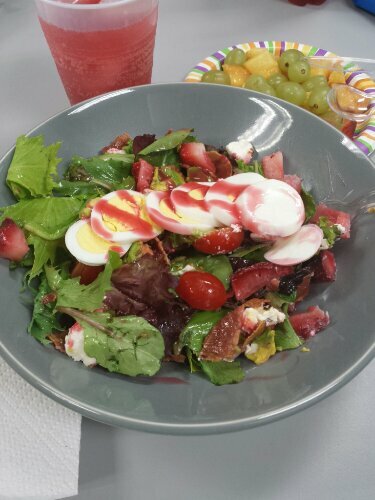 This delicious one was from yesterday: mixed greens, all topped with egg, turkey bacon, avocado, red pepper, cherry tomatos, strawberries and raspberry vinaigrette, mmmm! I always like having a healthy lunch because it not only keeps me feeling light, but also gives me the fuel to get through the rest of the work day! I usually have it with a side of: fruit, veggies and hummus, trail mix or some variation. And why ruin a good lunch with soda or calorie-stocked juice? I opt for either water, fresh brewed green or fruit teas, or light versions of drinks so that I don’t end up consuming 100-200 calories just from a drink! Oh hey! 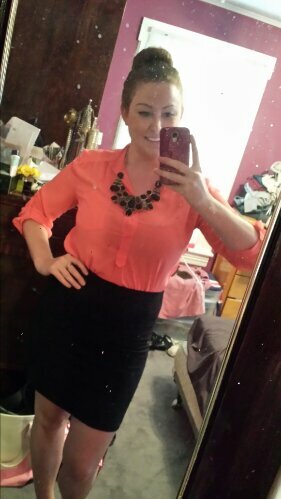 This was my awesome outfit from yesterday. I apologize for my mess of a room, but it’s the only full-length mirror I could work with. Anyway, some days I am just super lazy and throw on whatever I can find for work. However, every once in a while when I’m feeling motivated or fashionable, I put together a great combo like this one! Top from Akira Chicago, Bottom from Forever 21, Necklace from Forever 21, Sandals (which you can’t really see, sorry!) from Urban Outfitters. Awesome sock bun by me. 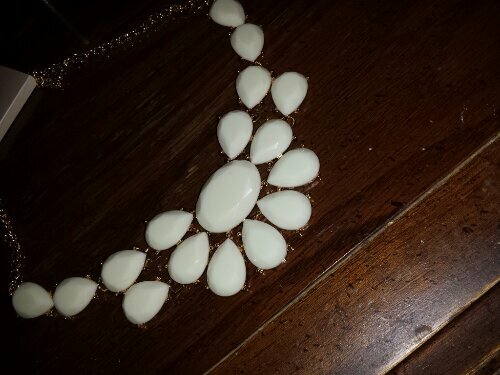 I am a chunky-necklace fiend. And I will never apologize or feel bad about it! I hate dainty little necklaces UNLESS they are either real-jewel gifts (like Kevin’s diamond heart-necklace I got for my birthday last year) or a long daingly chain with a charm/brooch/bottle on the end of it. Basically, statement pieces are my thing. So anyway, I had purchased a chunky white choker necklace in a slight flowery-shape a few months back, but unfortunately it just wasn’t made very well and I kept having to krazyglue parts back together, and it just finally broke this week for good. So, luckily I was at the mall the other day and saw this gem (HAH-GET IT!) at Forever21 and it was the last one in white! I had a tough time deciding between light pastel pink and white, but this one was the winner! Can’t wait to wear it and I’m sure you’ll all see pictures of it soon. 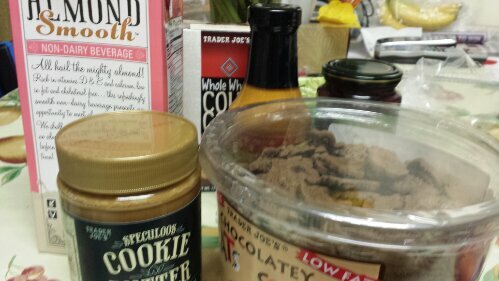 So I went to Trader Joes this week expecting to pick up about 6 items… and left with like 60! Once I enter that store, I just can’t stop buying! I absolutely love everything they have from their organic 19 cent bananas to their array of healthy chips and frozen snacks. While you can only see a few of the items in this picture, here’s a list of my favorite things I picked up: Speculoos Cookie Butter, Chocolate Cat Cookies, Vanilla Unsweetened Almond Milk, Black Bean Soup, Red Curry Sauce, Honey Goat Cheese, Whole Wheat Pizza Dough, PB&J Chocolate Bar, Zico Chocolate Coconut Water, Green Juice and sooo much more! 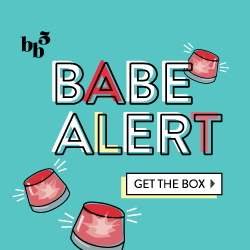 Stay tuned for more subscription box reviews, giveaways and more! It’s going to be a busy weekend/next week.